I almost can't believe this is fox portrait measures only one inch! Amazing stuff. Bricolagelife has made more of these tiny woodland animal portraits, or embroidimals as she calls them, and she writes about them here. How extremely cute and clever is this? Flossbox has used stumpwork on her pattern (which can be found here) making the whole piece look even more stroke-able! It makes me want to have a go at stumpwork now! Love this Twin Peaks inspired embroidery! When Twin Peaks was on tv I was a student and I think I watched most episodes on a tiny black and white tv. It was so exciting to watch at the time! 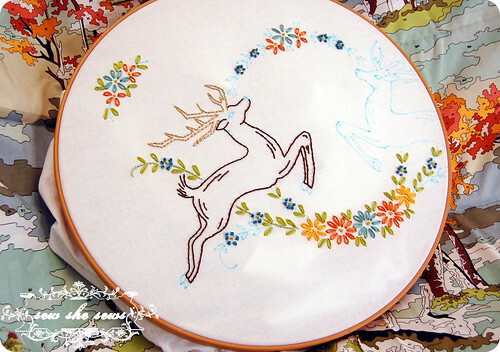 Isn't it great when an embroidery brings back lots of memories of a wonderful tv series just like that? Special Agent Dale Cooper, Cherry pie, mmmm.... Thank you Savvymojo! 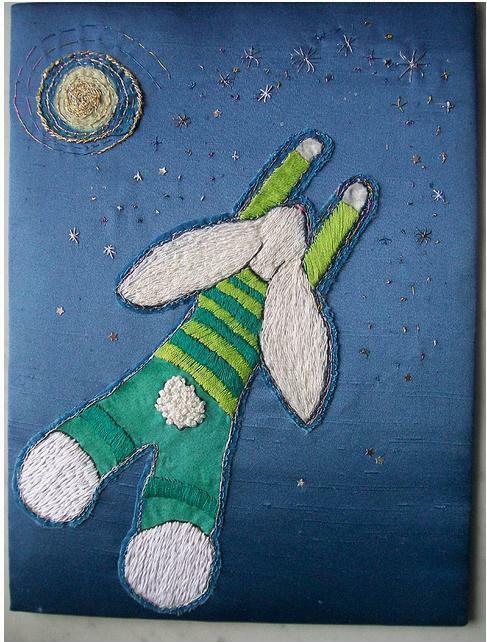 Unfortunately I can't bring you your weekly dose of new embroidery pattern today, as I can't find any to blog about, so instead I thought I'd bring you . . . . . . Superbunny! Superbunny is an original design by Dozydotes, apparently she had trouble with this piece, posting a picture of the same piece a day earlier saying she wasn't happy with it. I think both photos look great, I love all that fill stitch and how dynamic Superbunny is as he reaches for the stars! I am absolutely in love (or over the moon haha, sorry couldn't resist) with this entry for the Nasa/Etsy Space Craft Contest by Rachel Hobson, aka Average Jane Crafter. Apparently there is a chance that an handmade item will fly in space on board of one of the final space shuttle flights. Sadly Rachel's piece didn't make it to the next round (boo!) but the good news is that we get to keep it on our planet for now (yay!) 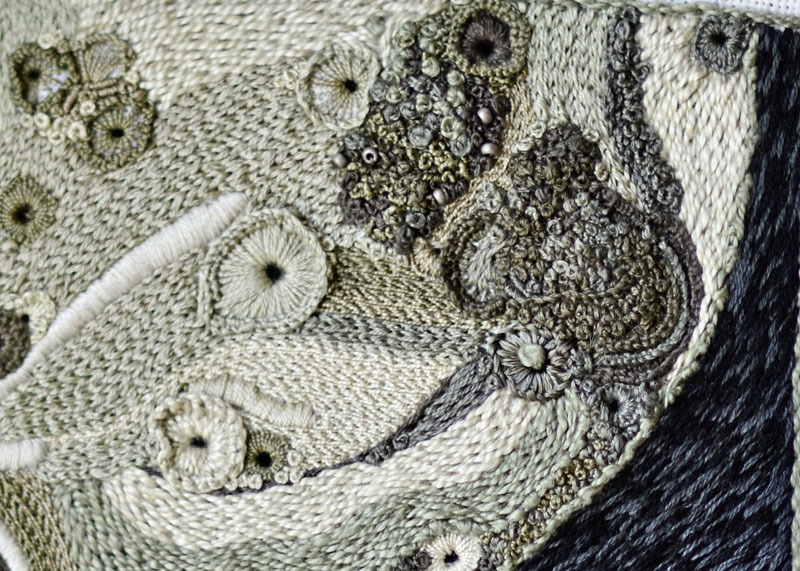 The stitches are amazing both in execution and variety, the texture is absolutely wonderful and you can tell from this embroidery how much Rachel loves the subject! Read more about this on Rachel's blog. 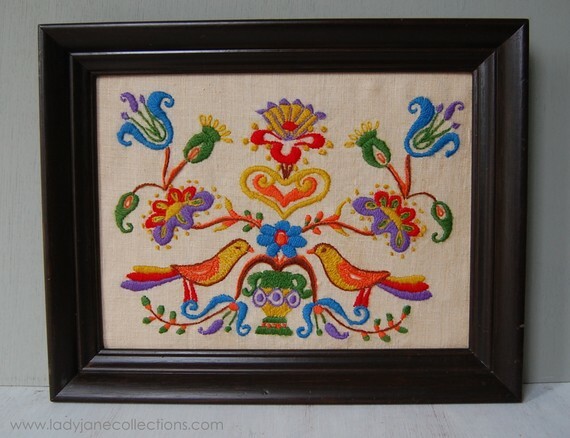 Melissa Davison, aka SweetStitches on Twitter, tweeted a link to me of this wondermous wall-hanging in colorful crewel. It's still available for sale in Lady Jane Collections' etsy store. But for how long...? ETA: Not long. It sold already! Today's patterns come from Feeling Stitchy's very own Carina. 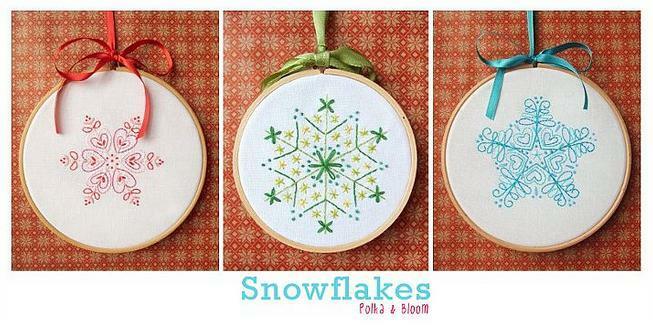 Snowflakes is the only pattern set Carina is releasing from her Christmas Stitches class, you can buy them together as a set or individually here. Perfect for some Christmas stitching! I must admit that I seldom use the Split Stitch as a filling stitch but this wonderful example embroidered by Refabulous. shows it can do the job perfectly! 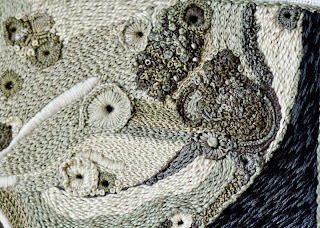 The filling stitches I most often choose, not taking into account 'semi filling stitches' like the Seed Stitch, are probably the Satin Stitch , the Long and Short Stitch and the Brick Stitch. What's your favourite filling stitch? I just thought I'd post a link to a QR code generator site, in case you fancy stitching one of your own. Fun stuff! You can select the content of the code: URL, text, phone number or even an SMS text message. QR code - Flash code, originally uploaded by Pichu71. Oh I like this! Stitching a QR code, c'est génial! What's a QR code? Wikipedia has the answer! "A QR Code, also known as a Box Code, is a matrix barcode (or two-dimensional code), readable by QR scanners, mobile phones with a camera, and smartphones. The code consists of black modules arranged in a square pattern on white background. The information encoded can be text, URL or other data." PS. 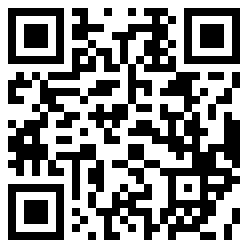 Check this post for a link to a QR code generator. 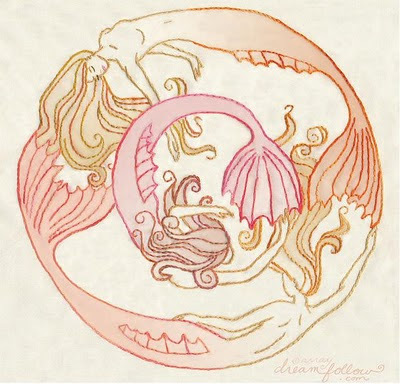 Isn't this new pattern, Mermaid Circle by Aimee Ray hypnotic? Aimee talks about the pattern on her blog, she's used crayon tinting and colour gradient floss for this pattern. As Aimee says, she had a hard time picking a colour to stitch this up with and she thinks aqua blues and greens would look great to, which is certainly something I'm tempted to try or maybe all monochrome in black, hmmmmmm, choices, choices . . . .
poem cushion, originally uploaded by chunkychooky. 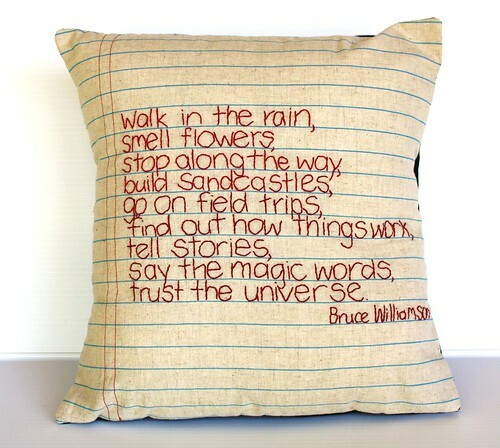 I like stitched words... This is lovely. 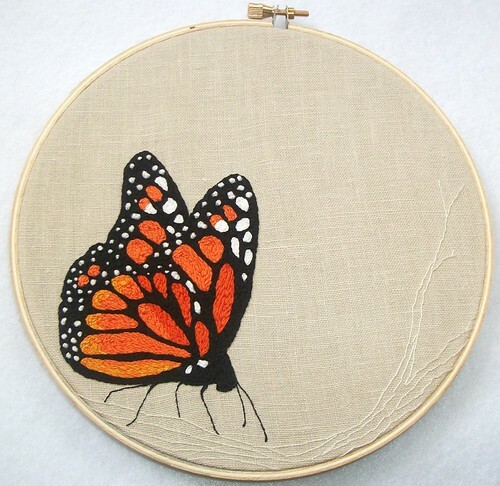 Beautiful embroidery in progress by Jaime (Sew she sews)! 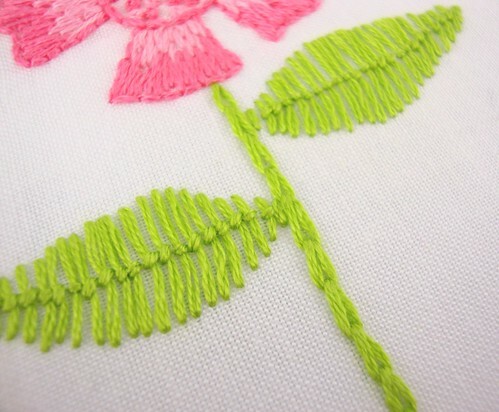 Love all the Lazy Daisy Stitches, the neat stitching and the colours are just perfect. I don't know about you but I really want to stitch this pattern too. Like right now! Well you can get your hoop out because Jaime has shared this vintage gem here for all to enjoy. Thank you Jaime. Good luck, Mr X Stitch! Hi everybody! Just a quick note to spread the word about Jamie Mr X Stitch Chalmers' big day tomorrow. He's been shortlisted for an Art Bursary, and tomorrow he'll be making a presentation to the Board explaining why they should choose to award the Bursary to him. Exciting stuff! 100 stitches - #14 roumanian stitch, originally uploaded by big B. Winner of the Quick and the Thread Giveaway! It looks like we have a winner! Helena, it's you! Please email your address to unafloresita AT gmail DOT com, so we can send your free author-signed copy of The Quick and The Thread to you!